The third installment of the Lisbeth Salander trilogy by Stieg Larsson came out in May 2010. Much to my delight, I received a copy of The Girl Who Kicked the Hornet’s Nest from Knopf for review. Let me say this, I’ve reviewed the first two books – well, I recommended The Girl with the Dragon Tattoo without telling you anything about it, and tried to give a complete review of The Girl Who Played With Fire. It should also be stated, in case this is the first review you are reading on this trilogy, I enjoyed just about everything about this set of books. In my humble opinion, Lisbeth Salander is one of the best characters I’ve seen in a long, long time. She’s quirky, she’s eccentric, and strangely, I think there’s a little bit of Lisbeth in all women. She is the epitome of all the things some of us wish we could do, but don’t really have the guts. For those of you who have read these books, go ahead and silently admit that you’ve thought it, you just didn’t do anything about it (whatever it is in regards to your inner Lisbeth) … you know you did. Lisbeth Salander is one of the most original and memorable heroines to surface in a recent thriller: picture Angelina Jolie’s Lara Croft endowed with Mr. Spock’s intense braininess and Scarlett O’Hara’s spunky instinct for survival…. No truer statement could have been made about Lisbeth Salander. Parts of The Girl Who Kicked The Hornet’s Nest was just as over the top as The Girl Who Played With Fire. In Played with Fire, there were some “yeah right” moments; and well, Kicked The Hornet’s Nest was no different. While I was enthralled during the reading, I couldn’t help but think there’s no way all this could actually happen. However, this is a crime thriller like nothing I’ve ever read before. I think one of the things I enjoyed the most is the lack of what I dislike the most about most crime or mystery novels. In this genre of books, more often than not, there’s a formula – first, the crime is committed, then there’s clues and one person begins to find them with the help of supporting characters and then the reader figures out “whodunit” before the crime solver, and eventually that person figures it all out. Its a little more complex than that, but that’s the gist. Larsson takes the formula and throws it out the window. Everything we think we know at the end of each book is not quite accurate to what the complete picture is. I think readers may know this subconsciously when closing the book; and well, that’s how the author hooks us. Each book in this trilogy is noteworthy by its own right. Stated before on Old Musty books is the notion that often times books in a trilogy can’t stand on their own. Also stated, these books can stand on their own. However, I believe the best reading experience for this trilogy would be to read them in order with little other reading distractions. There are few trilogy’s that I think should be read this way – Lord of the Rings is one of them, and The Dark Tower is another. Stieg Larsson’s trilogy fits nicely alongside these two groups of books. The Lisbeth Salander trilogy is by no means as in-depth as either of those two listed above. While all have some fantastical creatures and villains, The Girl Who trilogy has some villains that are more cartoon-ish than Boris and Natasha, but one should still be encouraged to overlook this as much as possible. The writing is enough to help one overlook this. Most of the characters are complex and engaging, the plot is intense and in-depth, and just when you think the story will go in one direction, there’s a swerve that sends you on a path you hadn’t even considered. It all comes back to Lisbeth Salander though (can you tell I’m a big fan?). 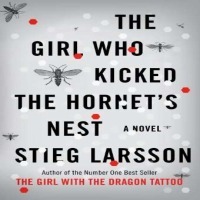 If you are looking for a great heroine, with an amazing story – I recommend Larsson’s books: The Girl With The Dragon Tattoo, The Girl Who Played With Fire and The Girl Who Kicked the Hornet’s Nest … in that order. You’ll find that one may be more of a favorite than the others (the first one is mine), but as a whole, you can’t go wrong with this series of books.